This iExpression is a variant of the Basic Smoother iExpression which is dedicated to 2D properties and allows to control the smoothing in x and y dimension separately. 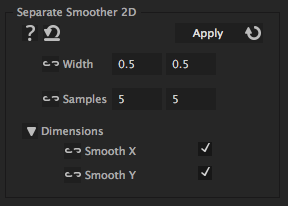 determines the amount of smoothness. The larger the width, the more smooth is the result - a value of 2 means, for example, that the values within a window of 2 seconds are taken into consideration to smooth each value. determines the accuracy of the smoothing. The more samples the more accurate is the result. For optimal quality it is recommendet to use a value that is 25 or up to 50 times larger than the value of "Width".